True Blue is a beauty, a dappled gray, and when Abby gets to take him to her family's ranch, she can hardly believe her luck. The horse needs a home: his owner--a woman brand new to the riding stable--was tragically killed in a car crash and no one has claimed him. Daddy is wary, as always. But Abby is smitten. True Blue is a sweetheart, and whenever Abby calls out, "Blue, Blue, how are you?" he whinnies back. But sometimes True Blue seems . . . spooked. He paces, and always seems to be looking for something. Or someone. 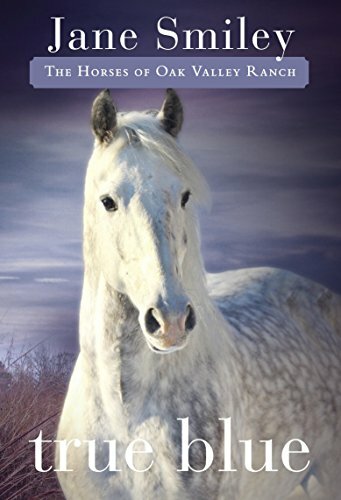 Filled with riding scenes and horse details, this newest middle-grade novel from a Pulitzer Prize winner offers a mysterious and suspenseful almost-ghost story. JANE SMILEY is the author of many novels for adults as well as three works of nonfiction. She won the Pulitzer Prize for <i>A Thousand Acres</i> and was inducted into the American Academy of Arts and Letters in 2001. She lives in Northern California, where she raises horses of her own.